A story that's not just important now, but for years to come, the DCEU has it's first truly fantastic film and audiences have a brilliantly realised and terrifically acted Wonder Woman to enjoy. The DC Extended Universe is one that, unlike Marvel, had almost hit immediate criticism since it’s inception. With it’s movies garnering mixed to negative reviews and less than expected box office returns for various reasons, the studio heads at Warner Brothers were staring down the barrel of a very unforgiving gun. To me, this was rather harshly and stupidly doled out. Whilst often not realising and reaching their full potential, the three previous entries into this universe have at least been ambitious and somewhat fresh in their attempt to separate it from the ever growing Marvel Cinematic Universe. In that respect, the hate it has received for it’s ambition has dumbfounded me. In an attempt to move away from the formulaic superhero template, it stumbled; but not without merit. Despite Gal Gadot’s spirited turn in the much maligned Batman v Superman, it’s critics were unsure whether she would be able to carry her own solo outing at all. This said, many saw Wonder Woman as DC’s chance to course correct it’s journey to a fully fledged extended universe. With that pressure unnecessarily lauded onto Wonder Woman‘s first live action feature length adaptation, it had to pass with flying colours. 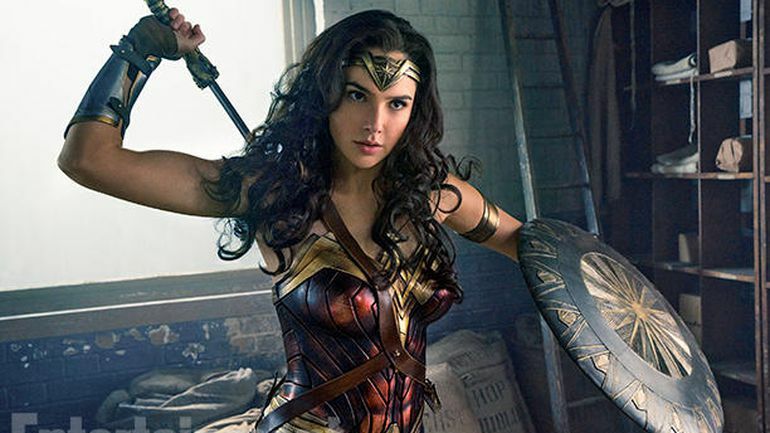 Helmed by director Patty Jenkins, this iteration of Wonder Woman draws from Diana’s origins as she first steps up to the mantle of the Themysciran warriors. Having never experienced the outside world, when a pilot (Chris Pine) crash lands on her shores and brings the hell of WW1 with him, Diana decides that it is her calling as an Amazonian to seek out the battle and end it, thus bringing peace to the world. It’s a story that strangely shares a great many similarities with Richard Donner’s Superman, in the sense that we spend much of the opening half an hour away from the world that most of the characters occupy. Furthermore, once we do leave her homeland and are thrust into the plagued world of WW1, we get this wonderful ‘fish out of water’ feel to Diana. It proves a shrewd move by Jenkins and her writing crew (of which, Zack Snyder gets a ‘story’ credit). By allowing Diana to enter this world which is dominated by violence perpetrated by men, the story allows her to become a beacon of hope, light, and justice. Let’s be absolutely clear, this is not the DCEU attempting to course-correct and copy the Marvel formula. The themes that have consistently run through their entries thus far about heroism, justice, and trying to do the right thing are consistently echoed here as well. In Batman v Superman, we meet Diana decades later, after learning about the world that she vows to protect and its shortfalls. By taking this journey with her, we see that she is indeed naive about the world. She does make mistakes in assuming a goodness in the world that isn’t there. And despite learning that the world isn’t what she thought it was, we see it through her compassionate and caring spirit. Like Superman, she cannot see injustice and head in the opposite direction. There’s such an earnest warmth to her character that we haven’t had thus far in this universe that draws us to this iteration of Wonder Woman. Thus, Patty Jenkins’ appointment was a masterstroke by those involved. Despite having only had previous feature length experience in the bruising and unforgiving Monster, she directs the proceedings with flair and gusto. Unlike the washed out, greyish-blue hue that dominated Zack Snyder’s films, Wonder Woman pops with colour and vibrancy and proves to be a visually joyful surprise. Also, by allowing the film to breathe (clocking at a healthy 141 minutes) the journey is allowed to take it’s course naturally. From the opening establishing shots of the heavenly Themyscira to the grey, grimy settings of German-occupied France, she helms with a sure hand. The film quite literally never sags or hits a bum note, flowing well and at a balanced pace. Furthermore, when the action does come, the film really does come to life. From the battle sequence on the beaches of Themyscira to the explosive finale, the direction is fantastically kinetic and athletic. The shifting camera angles and interesting shot choice prove work well to keep them fresh. There is a hint of an overuse of slow-mo after a while, but that hardly detracts from the uniqueness in which the set-pieces play out. The finale does get rather CGI heavy, but can largely be forgiven because of all of the good work that preceded it. Much was made of Gal Gadot’s casting as the iconic comic-book character and some of it not entirely unfounded. Having only really proven herself in the Fast and Furious franchise thus far (a series that obviously doesn’t require much stretching of the acting muscle per say) she had a lot working against her. However, with her turn in Batman v Superman and now this behind her, we can truly say she was the perfect choice. Gadot simultaneously comes across as fierce, noble and brave but also sympathetic and pure-hearted. Her Diana is a perfect balance of warrior and princess. There’s an undeniable need for more role models for girls and young women but her turn is so much more than that. You can’t help but feel utterly entranced and inspired when she’s onscreen. Wonder Woman is a character that defines the goodness and hope in humankind as a whole, and Gadot brilliantly captures this. This is her film and she owns it. The supporting cast around her are also excellently chosen and provide much of heart of the film. Chris Pine’s Steve Trevor perfectly captures the swagger of the old-fashioned, suave action-hero with aplomb and his chemistry with Gadot is undeniable. Connie Nielson, Robin Wright, Danny Huston and David Thewlis all alike, provide strong performances. The film slightly suffers with it’s villains, none of whom really register as a major threat – but this truly is a hero’s story. Wonder Woman (2017) Directed by Patty Jenkins. Distributed in the UK by Warner Bros. Certificate 12a.